Tired of all the bad cameras in the phones? 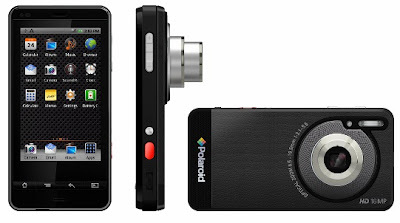 Kodak Polaroid launches a brand new camera mobile, named SC1630 Android HD Smart Camera. It looks like an old school camera and it has a 16MP camera unit and 3x optical zoom. But the camera has more than that. ISO up to 3200 and shutter speeds of up to 1/1400 and F3.1-F5.6 aperture. With xenon flash and also possibiltity to shoot 720p hd video. The screen becomes 3,2″ big (or small compared to other modern super phones…) It is not that thin (18.5mm) but if you think like me its not that bad when you in fact have a full phone and cam in one device! The price is expected to be 220 euros and will be available from April 2012. Best Title Game music track ever!